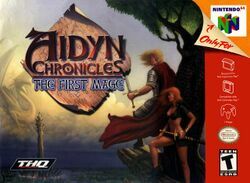 Aidyn Chronicles: The First Mage is a RPG for the Nintendo 64. The game was released near the end of the N64's developmental period. It was featured in Nintendo Power, the same place where much of its advertising came from. Additional Aidyn Chronicles games were planned, but the projects were dropped after very poor sales of The First Mage. The game is similar to Quest 64 in adventuring and fighting, where the player would encounter enemies within a three dimensional environment and then battle inside the bounds of that environment with some additional rules. Alaron, a young squire, is sent to track down a missing farmer named Kendall. On his journey, however, he runs into a spirit and gets poisoned by Goblins. In his quest for a cure, Alaron bands together with other warriors to help others and search for Alaron's only means for a future. Positive critics praised the creative storyline. Indeed, the storyline is one of the most important aspects of a Japanese-style RPG like this (even if Aydin Chronicles was made in USA). Negative critics complained about the limits of graphics and sound (it was the year 2001), but if you're playing it today, then you're a retro-player, and you probably won't mind at all. This page was last edited on 2 March 2016, at 02:07.